Successful online marketers use a combination of left and right brain thinking. The combination of left-brain analytical (or data-driven thinking) with right-brain creative (or content-driven thinking) is the secret to optimizing marketing in today’s digital space. 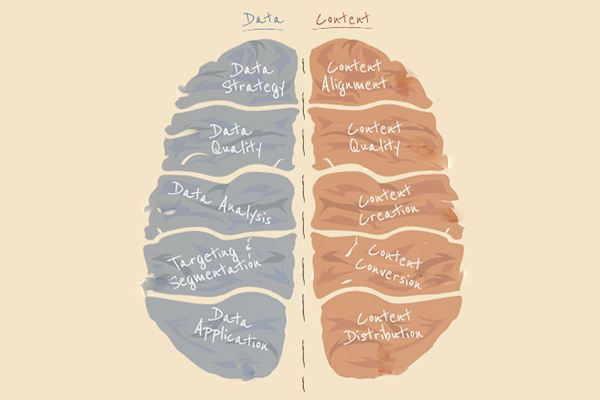 HarteHanks created the following infographic to demonstrate how successful online marketers use whole-brain thinking, a combination of analytical and creative thinking. Application — Companies that put data at the center of marketing and sales decisions improve marketing ROI by 15 to 20 percent. Strategy — 66 percent of marketers cite acting on data to improve marketing performance as a top priority. Analysis — 30 percent more time spent analyzing marketing performance data yields 3 times higher open rates and 2 times the clickthrough rates. Creation — 64 percent of B2B content marketers are currently challenged with producing enough content. Quality — 92 percent of organizations believe creating high-quality content is valuable. Distribution — Leading companies are more than 2 times as likely to promote content via social channels.